Shreya Ghoshal, the Queen bee of playback singing who gave a super performance last year in Worcester, MA, will start her North America tour starting August 9th. Boston, however, is not on her itinerary. Ghoshal is coming back with her team to enchant people of the United States and Canada with her mellifluous voice, soul stirring compositions and is known to sweep music lovers off their feet, where-ever she has performed till date. Her musical ability and versatility has not just entertained the Indian audience but has also garnered a lot of love and respect from every corner of the world. Hits after hits her songs are always at the top of any Bollywood chartbusters. There is newness and something special in each year's tour. Her strong vocal abilities make the song selection unique as it ranges from old classics to foot tapping Bollywood numbers. 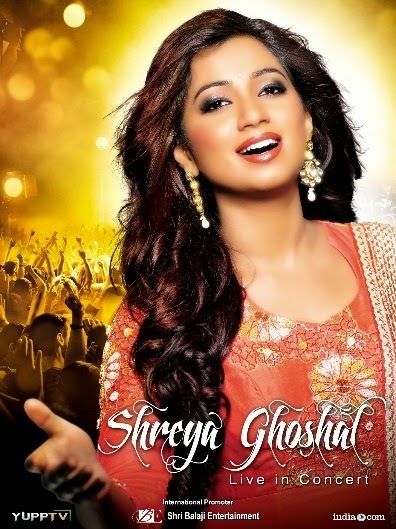 Ghoshal Live in Concert tour comprises of 12 cities with her group of 30 artists including vocalist, musicians, dancers, emcee, sound and light engineers. Although her entire fan club cannot attend these concerts because of the physical barrier however there have been a lot of tweets, Facebook posts and other social buzz about her tour that has created a lot of excitement within the music lovers, fans and followers across the world. In one of her recent tweets to her 1.6+million fans in twitter she says she is all set for it! Ghoshal has sung for most Bollywood actresses in recent years. When asked who are her favorite actresses she likes to sing for, Ghosal told INDIA New England News' Chai With Manju last year: "I enjoy singing for all of them; although I have to say that I have specially enjoyed singing for Vidya Balan and Kareena Kapoor just to name a few." On what does she looks for in an ideal man, she said: "Like all girls, I want him to be very loving. However, I am a very curious person and am interested in everything around me. I want him to have that curiosity about life too."